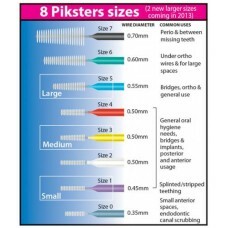 Piksters are like a toothpick with bristles and these bristles have the capacity to expand into the indents on the teeth surfaces, particularly at the gum line of molars and premolars. Piksters are made of tough nylon filament and stiff strong plastic coated wire which resists buckling and bending. They are also available in 8 sizes, and so there is a size that fits nearly any application. 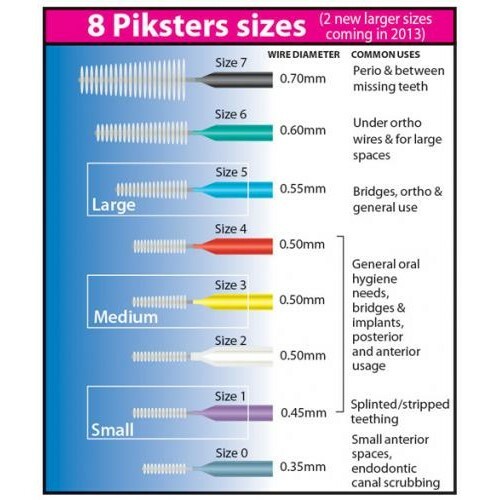 Piksters are used to remove plaque and food particles in areas normal toothbrushes don’t reach as effectively; between teeth, under bridges around implants and braces. Plaque is a significant factor in decay, gum disease and periodontal disease. Decaying food particles can also cause bad breath. Piksters bristles reach into and clean the indents between your teeth - especially at the gum line of molars and premolars. Floss is not as effective in this situation, although it is very effective in other areas and should be used in conjunction. Piksters are also reusable and so every brush has been provided with a cap so you can rinse the brush after each use and take it with you. The design is so small and compact they can be carried unobtrusively in a pocket or purse Like toothbrushes they are washed out and re-used until the bristles deteriorate or the wire has been bent several times. If you prefer, they can be disposed of after a single use. Contains 8 brushes. One of each size (0 to 7). Please Note: All interdental brushes, toothpicks and sticks can put pressure on the tip of the gum, especially if you force it, or use a brush that is too big for the space. This can cause a slight re-shaping of the gum over time. This is generally good for back teeth but most people like the look of the small triangle of gum growing in between their front teeth. Therefore, use the smallest size possible around your smile area .